Usain Bolt will be 100 per cent fit when the heats of 100 metres at the London Olympics get under way in 11 days' time, Jamaican team officials have insisted. The world's fastest man was conspicuous by his absence from the team's open training session at the University of Birmingham. Doubts over the defending champion's fitness have intensified since he was beaten by training partner Yohan Blake over 100 and 200m at the Jamaican Olympic trials at the end of June, while he withdrew from last Friday's Diamond League meeting in Monaco with a minor hamstring problem. Fellow sprint star Asafa Powell was also not at the training session, leaving some of the team's less heralded names to entertain the crowd of schoolchildren and students. Jamaican team manager Ludlow Watts said: 'By the time he gets to the Olympics Bolt will be competition fit. 'Some times in your preparations there may be certain disruptions, but I believe that he's adequately prepared. 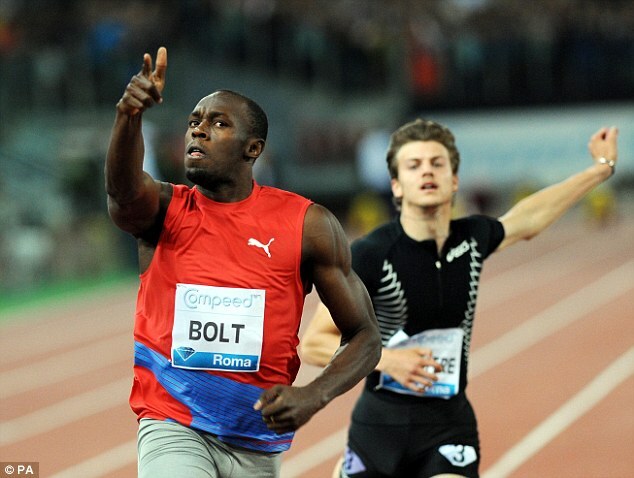 'He's training very well and by August 3 we will see the real Usain Bolt. Don Quarrie, the technical athletics manager, added: 'He's 101 per cent, he's ready. A repeat of the sensation Bolt caused in Beijing, when he broke the 100 and 200m world records in taking double gold, is what organisers and spectators alike are hoping for, but, despite Quarrie's assurances, his performances so far this summer have suggested it is far from guaranteed. He is ranked second in the world behind Blake in both events, with season's bests of 9.76 seconds and 19.83secs. Four years ago he went into the Games with runs of 9.72s and 19.67 under his belt.